How’s your winter riding going? Have you managed to keep up your training, or has the weather and lack of daylight taken a toll on your schedule? I’m ashamed to admit that I have not been riding as much as I should have. I’ve managed to get out to ride some, but not the three times a week I pledged to stick with all winter. When I admit this failing to fellow horse people, they’re usually quick to make excuses for me. The weather’s been crappy. It’s hard when it gets dark so early. You know the drill. If we’re being honest, though, we’ve been quite lucky here in central Kentucky. We’ve barely had any snow at all, and while we’ve had a fair number of cold stretches, it hasn’t been THAT cold. When I see photos from the northeast and Midwest buried under feet of snow, I can’t complain about the weather here at all. Nevertheless, winter is depressing for riders, isn’t it? Even if you have an indoor arena at your disposal, you and your horse are probably bored sick of it by now, and for those of us who don’t, riding outdoors isn’t quite so charming right now. Our plagues around here seem to be wind and mud this season. Neither is particularly conducive to a fun riding experience. But it’s almost March, and that means the end is in sight. Let’s run the numbers. Daylight Saving Time begins March 10: 11 days. That’s right, in less than two weeks, most of us here in North America will get an extra hour of daylight in the evening. 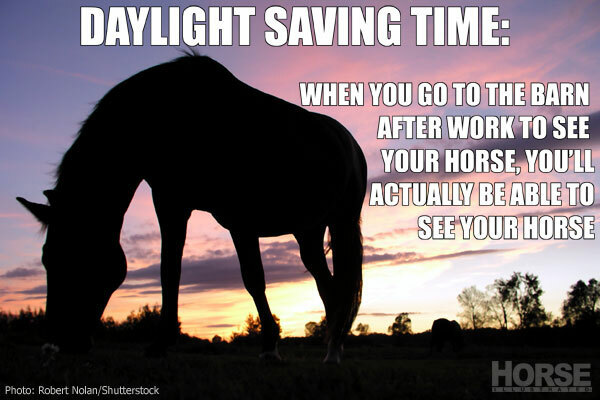 This isn’t helpful for you early birds who like to ride first thing in the morning, but I think most of us will happily transplant that hour of daylight from morning to night. Yes, it does mean we lose an hour of our weekend on March 10, but it’s a small price to pay for a later sunset, if you ask me. First day of spring, March 20: 21 days. Three weeks from now, we will be celebrating the spring equinox. Sure, it post-equinox snowstorms aren’t unheard of in plenty of places, but it’s a symbolic achievement in our climb across the calendar to make it to that first day of spring. Rolex Kentucky Three-Day Event, April 25: 57 days. For us here at Horse Illustrated HQ, Rolex is a definite indicator that the season is underway. In fact, even though it’s squarely in the middle of spring, I think of it as sort of the beginning of summer because it’s usually when I get my first sunburn of the season, no matter how much SPF 50 I apply and reapply. What are your spring indicators? Are you counting down the days to your first show of the season? Your overnight horse camping trip? Or do you go full-tilt year-round and laugh in the face of winter weather? Click “Submit a Comment” below and share what you’re counting down to. Here in PA, we have had about 7 snows, and never enough to cover the corn stubble in the fields. We’ve had skating once. I’ve been riding and doing groundwork w/ my two horses regularly over the winter, sometimes 5 times a week! I don’t think horses should get “put out to pasture” all winter long, I think they should keep getting used unless its outrageously cold or the owner’s crazy busy. I’ve gone on a 3 hour ride this winter as well. I don’t mind the cold too much, but I’m really looking forward to summer!!! and swimming the horses in the creek…..
Hard to believe that spring is just around the corner. Doesn’t change my riding amount. Just makes it more pleasant! I can’t wait until spring! The day when the Minnesota winter is gone is a day of rejoicing! I’m in the middle of WI, and we’re covered in a nice thick blanket of snow. I don’t really ride as much in the winter, but it’s getting to the point where it’s warming up. The other day I was brushing the horses and it was warm enough for me to peel off my jacket even with the snow. Plus, my horses are starting to shed. THAT is how I know spring is coming!